Dates and Banana Cake is a wonderful cake for festive season. It is Christmas time!! The joy, the happiness, the cheer, the love in everyone’s faces, the Christmas trees, lights, stars, the decorations and all that delicious aromas from the kitchen… Everything tell us that the best season of the year has arrived. This year, my Christmas recipe for you is “Dates and Banana Cake”. Christmas Fruit cake and Wine preparation is a major part of the celebrations. The celebration and excitement starts from the traditional mixing of fruits. 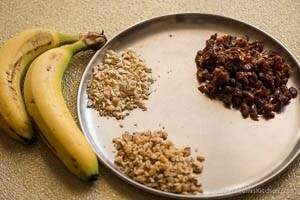 Ideally, the fruits are mixed much early, to allow it to mature nicely. The longer you soak the fruit, the more flavoursome it is. My mom has been following this tradition of baking fruit cake for more than 30 years. And every time she bakes with the same enthusiasm. Until recently, it was Mummy’s Traditional fruit cake for my Christmas, and I never had to make one on my own. This time, mummy kept on reminding me from the beginning of November, to mix the fruits,but I kept on stalling it for tomorrow, which never happened. Soon it was December and still I was at the same spot. Every time I saw the tutty fruity and the raisins I panicked but the ceremonious time never happened and then on desperate mode I started searching my recipes for an alternate quickie one. Chocolate strawberry cake, Black Forest Cake, Chocolate Orange cake, Dates and Carrot cake, Tutti frutti cake ; well, nothing seemed good enough to substitute for traditional Christmas cake. 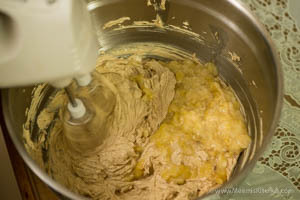 Eventually, I finalized on this Dates and Banana fruit cake recipe, and hurried on with my preparations. And soon it was done and off it went to the oven and the aromas started emanating. My christmas cake was ready and i got saved from mummy’s ” I told you “looks. Ummm.. Now, the problem is how do I make these craving tummies wait till Christmas?? Have to find a perfect hiding place for my precious Dates and Banana cake! Do try my Homemade wine – Grape wine, Dates wine or Banana Wine to serve along with the cake. You can keep the tradition of christmas alive, next time by invoving your kids to participate in the soaking of dry fruits. Check my Traditional Fruit cake, Rich Plum cake recipes for Christmas cakes. Spread lots of happiness and cheer to everyone. Celebrate the true spirit of Christmas! God Bless! Banana (Robusta) : 2 nos. Grind the Nutmeg (little), Cinnamon, Cloves and Cardamom (equally) together to make the masala. Chop dates finely and soak in Brandy for 15 minutes or more. Then heat it gently for a minute and keep aside for cooling. Chop the cashews and Walnut nicely. Seive Maida, Baking Powder, Baking Soda and salt and Masala. Cream Butter and powdered sugar till fluffy. Add eggs and beat well. Add the dates mix and mix well with a spatula. Add the mashed Bananas and vanilla Essence and mix well. Preheat the oven to 170o C. Mix the chopped dry fruits with the flour mix. 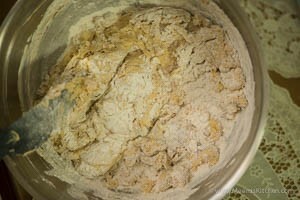 Add this flour little by little to the batter and fold in gently. 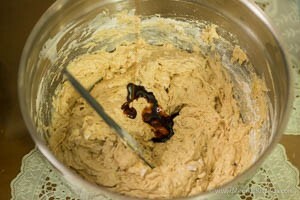 Lastly add the Caramel (dry caramel, melt sugar in a bowl on low flame till it turns to a golden syrup). Fold well and transfer to a greased tin. Bake for 50 minutes to 1 hour. Insert a tooth pick into the cake and if it comes out clean, the cake is done. Once it is cold, transfer to serving plate. Usually, for fruit cakes, it is best to keep it covered for two – three days to bring out the best flavors. Since this has Banana, it should be consumed in 3 -4 days. Have a great Christmas. God bless you and fill your homes with all happiness and love. Enjoy the delicious Dates and Banana Cake. You can use Rum or Brandy. Using Brown Sugar (Demerara)helps to get a dark color, however you can also use white sugar. Masala used is a mix of Nutmeg(little), Cinnamon, Cardamom, Cloves (in equal measure). You can grind more quantity and keep it for later. Dates should be soaked only for 15 minutes and should be heated on small flame for just one – two minutes. You can keep the cake in a closed container on a dark place for two days to bring out the flavors. Consume within 3-4 days. 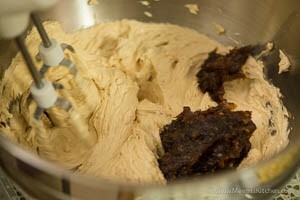 If you plan to keep it for week, it is best to avoid Banana and add more dates (1/4 cup) and 10- 15 ml Brandy/ Rum extra. 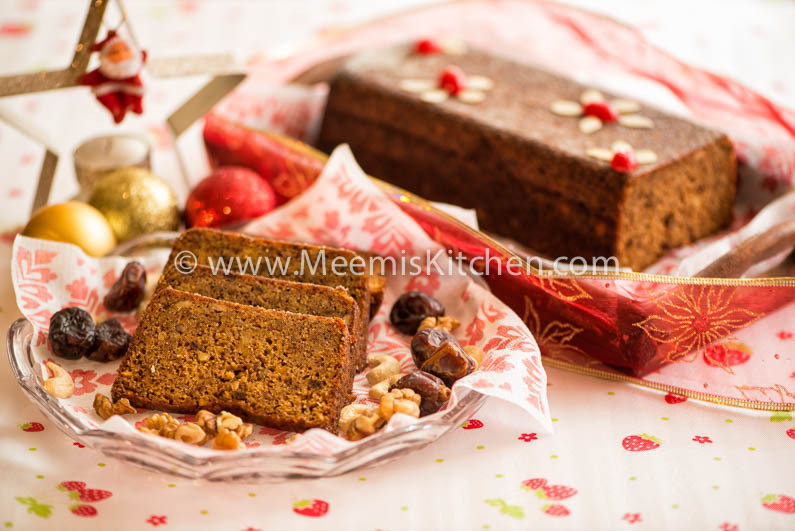 Relish the delightful Dates and Banana cake and have a wonderful Christmas season. God Bless!! !